On Saturday Berwick face what could be a season-defining game when they take on fellow strugglers East Stirling at Shielfield. The two teams are separated by only two points at the foot of the table, and this is a match both clubs will be desperate to win in their fight to avoid the wooden spoon at the end of the season. The importance of this match cannot be underestimated as the eventual basement side will face the play-offs to retain their league status, and manager John Coughlin will be hoping that his team can take all three points and thereby open up a five-point gap over their Falkirk counterparts. “In many respects this is probably the biggest game of the season for both clubs,” said Coff. “But after having three home games in a row postponed, all we want is some game time. 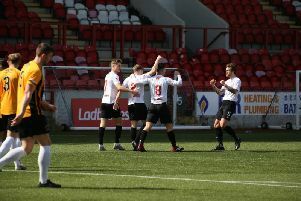 On Saturday, Rangers were due to face Queen’s Park in a Scottish League Division 2 fixture at Shielfield, but for the third home game in a row the match was postponed. The club had expressed concerns over areas of the pitch in the days leading up to the game, and whilst it passed an early morning inspection, a snowfall less than an hour later prompted officials to eventually call it off. Captain Jonny Fairbairn (suspended for two league games) and Stevie Notman (also suspended) will both miss Saturday’s game against East Stirling. Meanwhile, last week Berwick released striker Andy Russell, who was signed by former manager Colin Cameron from Cowdenbeath, and replaced him in the squad with Sandy Cunningham, who joins on loan from Stirling Albion until the end of the season. Cunningham, (20), has been with Albion for three years and was previously at Falkirk, where he was a regular in the first team.